Wine enthusiasts, from beginners to seasoned collectors, collect a good lot of wine bottles, which require proper storage. A wine cooler or a refrigerator does the job very efficiently. It is a well-known fact that wine has to be stored properly under the right conditions to maintain it properly. This is where wine cellars and wine coolers come into play. A wine cellar offers an ideal environment to store the wines, by maintaining a stable temperature, the correct levels of humidity, stillness, darkness etc. A seasoned wine collector acknowledges this fact and goes in for an adequate storage solution. There are different types of wine coolers and wine refrigerators available, with different types of capacities and features. Choosing the right wine refrigerator need not be an overwhelming step, once you know the features and specifications that you are looking for. Here is a review of the Wine Enthusiast Silent 32 Bottle Refrigerator. This review contains the best features of the product as well as the negative aspects. This review should help you in buying your wine enthusiast fridge with ease. A free-standing wine refrigerator, Wine Enthusiast 32 Bottle Refrigerator is a silent operator, which runs very smoothly and quietly. It is a dual zone wine cooler. It is a Thermoelectric and energy-efficient wine cooler. It is also CFC-free. Given below is a detailed explanation of the different features present in this Wine Enthusiast Fridge. 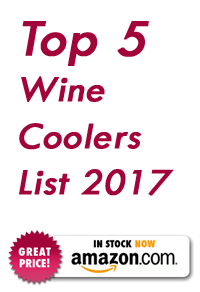 The Wine Enthusiast wine cooler, the Silent 32 Bottle Touchscreen Refrigerator is a free standing wine cooler. It means it is designed to stand alone and dissipateheat from the back. This has an easier setup when compared to the built in coolers which require sufficient integration into the kitchen in terms of the placement, as it tends to affect the compressor of the fridge. The free standing model is very ideal for anyone just starting out on a wine collection. This model of the Wine enthusiast wine cooler comes with the dual zone technology. It has two temperature zones and two storage zones. Each storage section can be set at different temperatures, making it ideal to store both red and white wines in the same wine cooler. The top zone adjustable temperature range is 54-66°F which provides ideal storing conditions for red and white wines. The bottom zone adjustable temperature range is 46-66°F and makes for optimum serving conditions for most white wines. Being thermoelectric wine cooler, the Wine Enthusiast fridge is unlike the traditional fridge with the compressor and refrigerant. This wine refrigerator has a cooling node which makes for silent cooling. These thermoelectric wine coolers generally produce fewer vibrations and are ideal for wine storage. However, they do have internal fans to distribute the cold air within the cooler. They consume less energy and the cost of operating is lesser when compared to the compressor-based wine coolers. The exterior digital touchscreen display enables easy control of the temperature settings. The door hinges are to the right and the door is a glass door. It has a reflective Thermopane smoked door with recessed handle & stainless trim. The storage capacity is 32 bottles with two 16 bottle zones. The shelf type is wire. There are seven pull-out chrome shelves, which keep the bottles very organized. It has interior LED lighting, which gives good visibility. It has a frost free automatic defrost feature. Being a free-standing wine cooler, the Wine Enthusiast Silent 32 Bottle touchscreen Refrigerator tends to occupy space. You need to have that additional space at home to keep this unit. Hence it is not suited for a smaller but could be ideal for larger homes with larger spaces. This wine cooler cannot fit beneath the counter, as this affects the cooling and heating system. It is not a built-in type of model of wine cooler. Even though it has a 32 bottle capacity, only the standard bottles fit. Not all wine bottles with different sizes fit inside this wine cooler. By storing different sized wine bottles, the storage capacity is reduced. There is a humming noise that emanates from the wine cooler, despite it being a silent thermoelectric wine cooler. For this fact, this wine enthusiast fridge should be placed ideally away, at a place where the humming noise is not a bother. The Wine Enthusiast Silent 32 Bottle Touchscreen Refrigerator is a big and accommodative wine cooler. With its huge storage capacity of 32 bottles, even nonstandard size bottles can fit in easily. Being a thermoelectric wine cooler, the wine enthusiast fridge is an environmentally friendly refrigerator. It is free of CFC emissions and is energy efficient. While other wine coolers in the same category have compressors which also result in vibrations, this wine enthusiast fridge is comparatively very silent in operation. The vibrations are absent, which makes it very ideal to store wine bottles. The dual zone present here allows the users to store both types of wine- red and white wine bottles, without having to go in for two different wine coolers. Typically, white and red wine requires different temperature zones for storage. The dual zone present here allows for very easy storage of both kinds of wines. The temperature range that is suitable for white wine is 46°F to 56°F and that for red wines is 58°F to 68°F. However, if the dual zone is not present as in some of the other models, like the AKDY 32 BTL Electric Wine Cooler Cellar Chiller Single Zone, one has to go in for two wine separate wine coolers to store the different wines. The Wine enthusiast fridge, the Wine Enthusiast Silent 32 Bottle Touchscreen model is a beautiful looking wine cooler that fits perfectly in your large home. With its dual zone storage space, storage of red and white wines in the same fridge is not difficult as different temperatures can be maintained easily in the different zones. With its energy efficient features, the operating costs are cut down. Comparatively, it is a silent operator, except for the low humming sound that emanates from it. The vibrations are not present as it is a thermoelectric wine cooler. All in all, the Wine Enthusiast Silent 32 Bottle Touchscreen refrigerator is a good buy, worth the price for the features it gives. It is a perfect size fridge that is ideal for a growing wine collection. 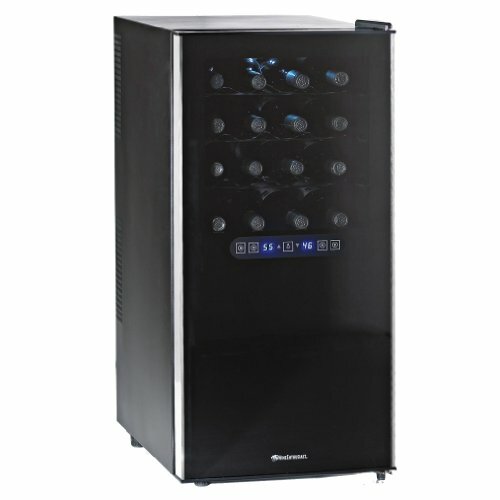 This is an elegantly built wine cooler, with the touch screen temperature display and the internal LED lighting display. It fits very well in any part of the house. Maintaining a stable temperature is not at all an issue with this wine cooler. It is very easy to use, sturdy and durable. Its beautiful design definitely stands out and makes it a wine aficionados’ first choice. On the basis of style, storage capacity, climate control, price and other features, the Wine Enthusiast Silent 32 Bottle Touchscreen refrigerator is a highly recommended wine cooler.